Being smart online – are we doing it right? This week during Stay Smart Online Week is the perfect time to assess the online habits and behaviours of our kids. But what about us as parents? 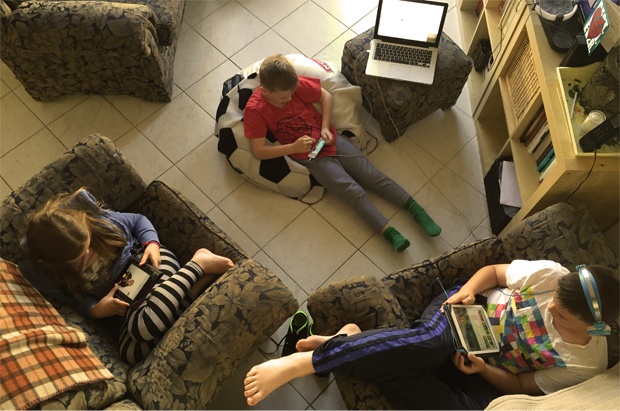 Does how we use technology influence our kids? Will limiting screen time protect our kids or just cause other problems? We all want our kids to be safe online, but maybe we are going about it the wrong way. An interesting article has been written by Jocelyn Brewer, a Sydney-based psychologist which actually raises some really interesting points. Jocelyn argues that being smart online is also about protecting our digital health and wellbeing while creating healthy digital habits. Jocelyn discusses the obsession with “screen time” which she believes is kind of a red herring when it comes to online safety. As with absolutely everything in life, it’s about quality over quantity, and factoring in the psychological state of the individual who is spending time online. Trying to put a “limit” on screen time is not a useful, or smart exercise. I agree that limiting screen time is not the be-all and end-all in keeping kids safe online. We need to know what they are watching, playing and who they are communicating with on their devices. I have published the full article by Jocelyn below and it is really worth a read. We’ve all seen it – that family at the café, heads down, scrolling on screens. Tsk tsk! We judge instantly and bemoan a loss of connection with nostalgic memories of how we used to play cricket in the street and talk to each other instead. Cue the sensational headlines warning of the dangers of screens being linked to everything from speech delays to autism and stripping humans of empathy, replacing it with narcissism – these play into our niggling fears and are rich sharable fodder for social media where we can absolve our parenting doubts with digital thumbs-up. Regularly our tech use is compared to drugs and addiction, a harsh and overplayed analogy that further entrenches melodrama while failing to propose the practical skills to empower positive digital citizenry. Preparing young people for a technologically enhanced future requires older generations to become meaningfully engaged in the complex issues of what it means to be a human in an online world – one in which most children have a ‘digital tattoo’ before they’re born and on average 1000 images shared on social media by their 5th birthday. Modern parents are just as likely to be glued to their screens as their teenage offspring. While they’re checking work emails from the footy sideline in an effort to keep the epidemic of busyness at bay, they’re playing a powerful role in their child’s social learning. Like playing dress-ups in high-heels, children mimic adults’ tech-use – watching eagle-eyed at the brightly lit screen and competing with the device for attention. Not ‘getting’ technology is no longer an excuse that these ‘digital immigrants’ can hide behind while young people are left, quite literally, to their own devices. Where high-powered computing gadgets are regularly gifted for birthdays and festive seasons, and ‘keeping up with the iPhoneses’ is a by-product of digital obsolescence – we need to also give the gift of digital literacy and digital intelligence (DQ) by knowing how to model it ourselves. Being ‘smart’ online is not simply about protecting kids from being groomed by predators, stopping them from sexting or saving their grandparents from online email scams. More-and-more it’s about our overall digital health and wellbeing and our ability to find that elusive balance between using technology to flourish and getting trapped in a downward scrolling spiral. This week is Stay Smart Online Week. It’s an opportunity to move beyond the simplistic narratives of ‘switch it off’ and counting digital calories through ‘virtually impossible’ screen time limits, and engage in the tougher, deeper conversations around the quality of the online content, the context in which its consumed, and the cognitions that accompany it. While computers will certainly become more and more invaluable to parents, there’s no app “solution” (yet) for present, patient parenting. Banning technology or promoting ‘detoxing’ from it doesn’t equip us with the skills to moderate usage. Instead it becomes a salacious item to cunningly access or to binge/purge from. Conversely using screens to bribe or pacify young people as they learn to regulate their emotions can teach dysregulated responses and demand behaviours. In some instances, we can use software to mitigate security risks, track our scrolling habits and help regain control of our time online, but increasingly it’s the development of ‘soft skills’ – traits linked to emotional intelligence – that are key to mastering a savvy and sustainable relationship to technology. What’s missing are the skills to stop and smell the science – to think critically about the headlines (many of which we can’t resist sharing out on social media, sometimes without even reading), the quality of the research we’re shown and the discourse that goes with it. Both media and digital literacy are skills, quite different to the traditional technical ones, that cannot be taught effectively by ad-hoc school incursions or annual guest speaker slots. Parents and schools must be partners in providing young people with ongoing and authentic opportunities to safely explore the digital frontier and to understand the emerging cyber-psychological issues which add a new layer of complexity to an already challenging developmental period of their lives. So, next time you see that family in the café – maybe wonder if they haven’t already been on a long bike ride together and dig deeper into what they’re really doing, reading an open source journal, improving their phonics with a research-backed app, chatting to a cousin in Hanoi or booking into their next gym class. It’s not all sexting, selfies and Candy Crush. Beware of sensational headlines about the zombie apocalypse: the kids are alright. Being smart online is also about protecting our digital health and wellbeing, creating healthy digital habits (including how we think and behave online). Screen ‘time’ is a simplistic metric and we need to ask deeper questions about the quality of the content, context and function of the activity. Parents benefit from checking/correcting their own online habits and consider their role as media-mentors, and co-consumers/participants alongside their kids. Digital abstinence or detoxes, bans or a reliance on monitoring software don’t teach the social-emotional skills required to use technology in a balanced meaningful way. Developing digital literacy and digital intelligence (#DQ) are crucial skills for being a savvy digital citizen. 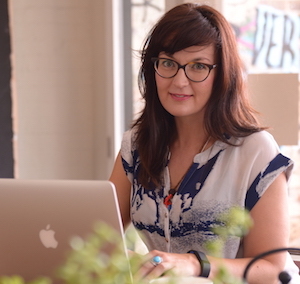 Jocelyn Brewer is a Sydney- based registered psychologist with 15 years’ experience in the education sector. She is part of Australia’s first cyber-psychology research group at the University of Sydney and the founder of Digital Nutrition. 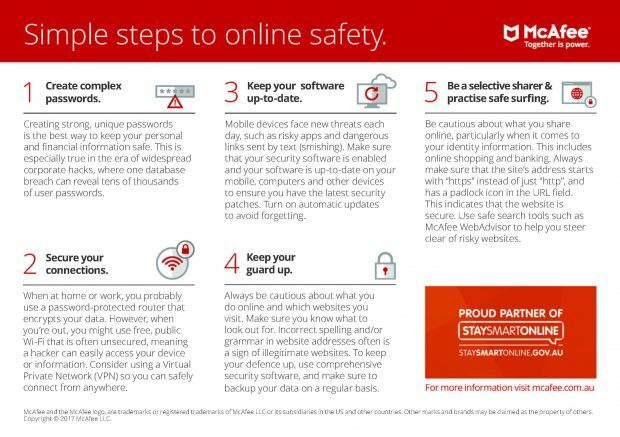 Jocelyn is partnering with McAfee for Stay Smart Online Week – Monday 9th October through Friday 13th October – to help drive the conversation about smart online behavior with both adults and kids. This is a sponsored post in collaboration with McAfee.